Ethel Stark is a famous violinist and conductor from Canada. She is widely recognized in Canada for her contribution to the country’s cultural scene, as documented in the “Celebrating Women’s Achievements” series from Library and Archives Canada. Born in 1916, Ethel Stark began her music journey under the tutorship of famous music educators, Alfred De Seve and Alfred Whitehead at the McGill Conservatory. At the age of 12, she studied at Curtis Institute of Music in Philadelphia with Lea Luboshutz (violin), Carl Flesch (violin), Louis Bailly (chamber music), Artur Rodzinski (conducting) and Fritz Reiner (conducting), for 6 years, from 1928 to 1934. 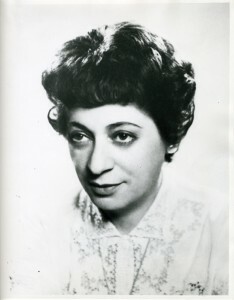 Ethel performed multiple roles in her career in violin music, as a top violinist, a music conductor, and as an music educator later in her career. She performed soloists for many of Canada’s top orchestras, and was also a founding member and guest conductor for many orchestras. Later in her career in 1962, Stark went on a trip to Europe to research violin methodology on a grant by a Canada Council. She also became the music educator for various music conservatories around the world. Stark taught at the Catholic University of Washington, Conservatoire de musique du Quebec a Montreal and Concordia University. Throughout her career as a violinist, Ethel Stark has achieved many great accomplishments. At the age of 18 in 1934, Stark become the first Canadian woman to perform as a soloist in a program broadcast throughout the United States, with the piece Tchaikovsky Concerto with the Curtis Symphony Orchestra under Fritz Reiner. Stark also performed in several famous orchestras in Canada, including the Montreal Orchestra, the Toronto Symphony Orchestra, the CBC Montreal Orchestra. In 1946, she started two compositions with the CBC radio – Sonata for Violin and Pianoforte by Violet Archer, and Hugh Poynter Bell’s Sonata. Ethel Stark also became a great music conductor in her career. In 1940, she founded the Montreal Women’s Symphony Orchestra, the first Canadian orchestra which consisted of women only. In 1976, Stark was awarded by the Concert Society of the Jewish People’s Schools and Peretz Schools for her outstanding Canadian artistic personality. In 1979, she was made a Member of the Order of Canada, the second highest honor of merit which honors the achievement of outstanding merit by Canadians. In 2003, Ethel Stark was made a Grand Officer of the National Order of Quebec. During her violin and music career, Stark was known to have played on the antique violin – the Molitor Stradivarius, the 1697 violin made in the beginning of famous violin maker Stradivarius’ ‘golden period’. The violin become the most expensive violin in the world in 2010, by commanding an auction price of US$3.6 million.